DR fine jewels the one and only company from Domician origin which is famous for amber and larimar jewelleries. This company extracts the amber stones from the mines of Domician republic as well as from some mines in Mexico and then designs the stones with perfect shape as well as perfect finish. These amber stones are non-other than fossilized tree resins which is turned to stone. This company offers amber stones to the customers as a wholesaler of amber stone as well as larimar stone. Some amber stone contains stamp of fossilized animals haphazardly but this company shapes the stone to give a perfect look. On their site you will see amber jewelleries and larimar jewelleries like amber necklace, amber pendants, amber ear rings, larimar pendants, larimar necklaces. They also offer single amber stone to bulk order of only stones and the same thing for larimar stone too. Amber stone is defined by its capacity of reflection of light. Green amber is regarded as the best among the amber stones, and it is also available on the site of DR fine jewels in reasonable price. 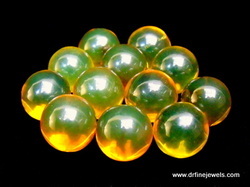 These green amber stone are characterised by greenish reflection of light. So if you are searching for blue amber in particular then you can easily get those on the site of DR fine jewels.To have these items at your place just go through the products and then select the items to add in your cart. Give your address there followed by bill payment and wait to receive the product at your place.